In Nigeria an estimated 3.5 million people are living with HIV, but only half of them receive care and treatment. Donor funding accounts for more than 70% of the country’s HIV and AIDS response, but more resources are needed to sustain and expand this care. 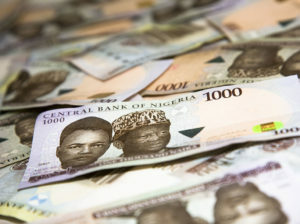 To remedy the coverage gap, Nigeria will need to mobilize more of its own resources. With support from USAID/Nigeria, HFG, and the Strengthening Integrated Delivery of HIV/AIDS Services (SIDHAS) project, four of Nigeria’s State Agencies for the Control of AIDS (SACA) have developed domestic resource mobilization strategies for the HIV and AIDS response. These strategies are designed to stimulate government financing for HIV and AIDS programs in the state, and outline potential new funding sources, including those from the private sector. Rivers, Cross River, Lagos, and Akwa Ibom states are at different stages of implementing strategies aimed at stimulating both public and private spending for HIV and AIDS. The strategies include ways to effectively govern the allocation and use of funds. Despite wider economic challenges, including the impact of low oil prices, Cross River state has seen a 300 percent (additional $1 million) increase in budgetary allocation for HIV programs by the state government, with a sustained 24 percent (additional $400k) increase in 2016. 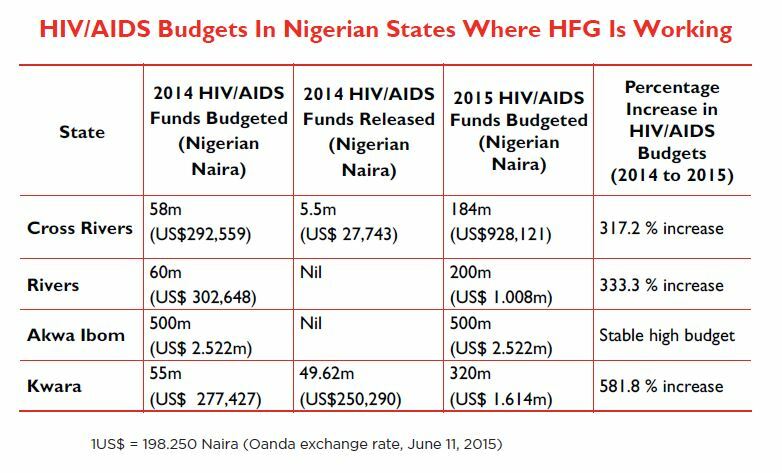 HFG’s collaboration with SACA also led to increased budgetary allocations for 2016 in Lagos state, with a 38 percent increase ($92,000) from the 2015 budgetary allocation for HIV and AIDS. In partnership with state institutions, HFG is supporting the implementation of specific parts of each strategy. The project is conducting financial analyses including a fiscal space analysis for the HIV and AIDS response, an HIV and AIDS and health sector budget tracking analysis, and a public financial management (PFM) process review. HFG’s initial rapid assessment found limited quantitative information and PFM issues – budgets were not well-defended and funding was not being released. In Lagos state, the project provided data to support the quantification of gap costs, and worked with the SACA to strengthen the budget defense process by highlighting the impact of HIV and AIDS programs on population health, and the danger of failing to finance them given donor unpredictability. In Cross River, HFG and partners supported the defense of the 2016 budget proposal for HIV and AIDS funding. 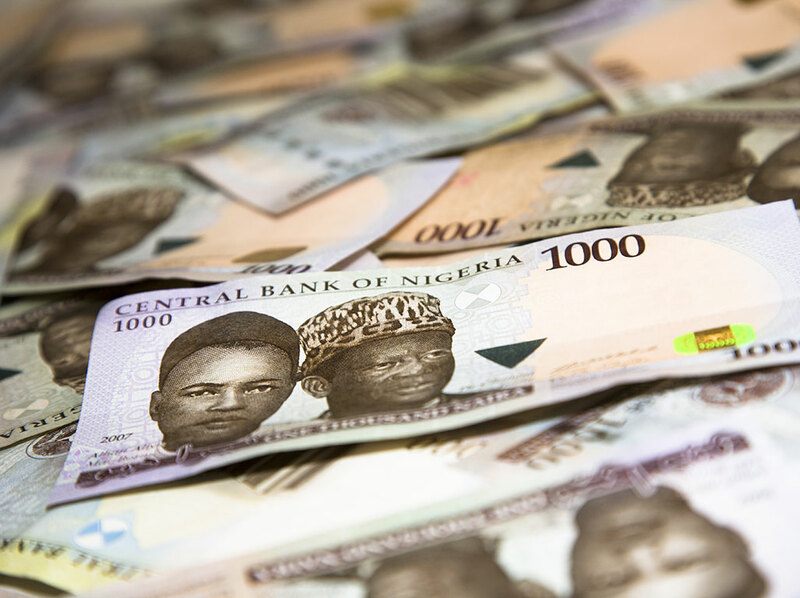 HFG and partners have effectively engaged with the finance, and economic planning ministries, as well as governing bodies, such as state government houses of assembly committees on health. This multi-dimensional approach to domestic resource mobilization, addressing several bottlenecks simultaneously—a first at the state level—has built support for increased state funding for HIV and AIDS.